Kasey Mcintyre, her cousin, and her best friend are visiting the town of Inferno, California. They’re just there to watch Kasey’s dads recognition ceremony at the local firehall, but there’s trouble kindling for the three of them and it’s going to stop them from enjoying their visit. Brothers Zach, Jake, and Cody Kelly feel their libidos ignite when Kasey’s car almost collides with their fire engine. The three brothers always knew they’d find the right woman to share, just as they always knew that they’d be raising their future family here in Inferno, where their chosen lifestyle would be accepted and respected. 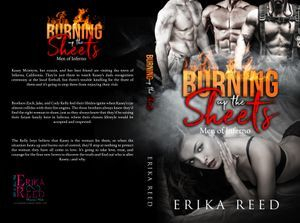 The Kelly boys believe that Kasey is the woman for them, so when the situation heats up and burns out of control, they’ll stop at nothing to protect the woman they have all come to love. It’s going to take love, trust, and courage for the four new lovers to discover the truth and find out who is after Kasey…and why. Warning: This book was previously written under the title "Blazing Inferno". It has since been re-edited and bonus reading material has been add.